Required: Compute the payback period of the project. Would the project be acceptable if the maximum desired payback period is 7 years? 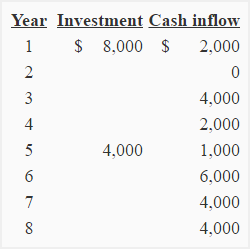 As the expected cash flows is uneven (different cash flows in different periods), the payback formula cannot be used to compute payback period of this project. The payback period for this project would be computed by tracking the unrecovered investment year by year. The entire investment is expected to recover by the middle of sixth year. The payback period of this project is, therefore, 5.5 years or 5 years and six moths. The project is acceptable because payback period promised by the project is shorter than the maximum desired payback period of the management. Perfect solution for my problem. Thank you for this work. 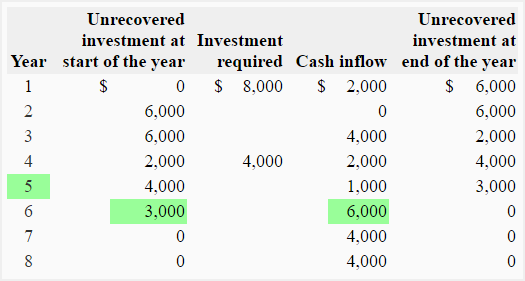 how to calculate month and day in payback period? I don’t understand the solution to this problem, need help. You know that the money is paid back during the 6th year, but to work out the month you do this. So, if you look back at the table you can find these figures and put it into the equation (don’t worry about minus figures). Therefore, the answer will be 6 years and 6 months.